Marking the end of the Cote d’Or (Part 2), we stopped off at a cave in Mercurey for the final tasting of Burgundy wines. Upon entering, I was immediately put off by the Enomatic machines but after the short battle between the logic and emotion, I stayed and tasted some wines, hearing the chattering of tourists. 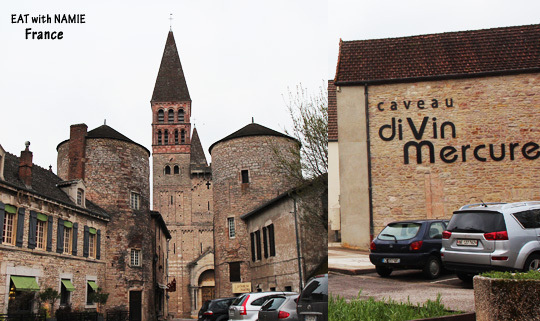 We quickly drove through Macon and reached Beaujolais, where another surprise was awaiting me. Like many people, I instantly frown at the sound of the name, Beaujolais, all because of the worldwide reputation of Beaujolais for its marketing gimmick. I was dreading at the thought of tasting that cheap bubblegum wine. 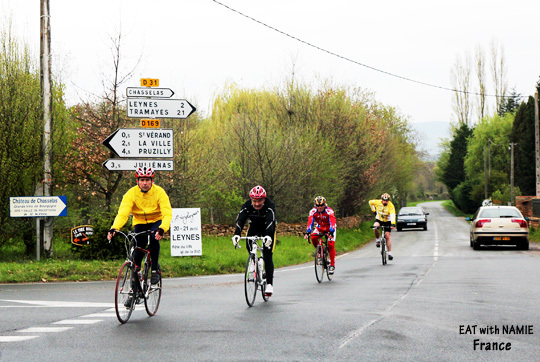 Driving through the Beaujolais villages, I thought to myself, “The villages are rather charming, flowers everywhere, like a real farmer’s village.” I saw many cyclists riding up and down the hills in that area, too; it had a real French feel in the air. The spirits of natural, laid-back life with good food may reflect on their wines, perhaps…straightforwardness without pretension. After a quick tasting in Julienas, which was so-so, we stopped at Chateau de Chenas where we had a long chat with a weather-beaten, hardworking wine grower&producer and his wife about wine making techniques including carbonic maceration, by which I had been fascinated and also confused recently. What triggered my curiosity even further during this trip was having come across so many bottles that gave the tingly sensation on the tip of the tongue, which I suspect comes from carbonic maceration and what people perceive as minerality, and what Robert Parker likes. As I am still learning about wines, I hope people don’t get offended by my lack of knowledge and hope that some experts will find my pages and correct the wrong information given here. He doesn’t flush the vats with carbon dioxide, as generally described in the process of carbonic maceration, which sounds like a high technique and costly. How can poor farmers afford the machine in the first place and sell their wines at €3-5? It doesn’t make sense to me. He lets carbon dioxide produced naturally during the fermentation do the work. The carbonic maceration is called maceration traditionelle (compared to maceration carbonique) and the whole bunches of grapes are placed in a tank and the grapes at the bottom are crushed by the weight of the grapes above them, starting to ferment and release CO2. before the yeast fermentation. This method helps to make wines produced from Gamay less tannic and more aromatic with lush fruit flavours of red cherries, strawberries and raspberries. I’d never seen barrels with so many stains! They seem natural, but does it mean something else? I tasted, first, the wines that didn’t go through barrel fermentation and then the ones that did. The wines without the barrel influence were perfectly delicious and the ones aged in the barrel were more complex and spicier. I was slightly taken aback by the unexpected depth of colour and taste; luscious fruit and violets on the nose and concentrated forest berries and wet stones on the palate and faint spices with powerful tannin, which is different to the smoky, licorice and tobacco like tannins in Bordeaux reds. 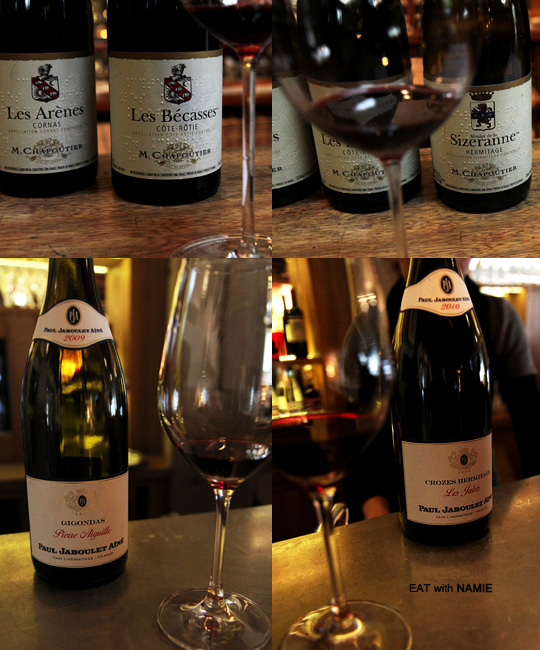 While tasting the wines and being surprised by the new discovery, I remembered how a French acquaintance once responded to my “I won’t even touch Beaujolais wines.”. He said, “Not all Beaujolais wines are bad. You might find some surprises.” He was right! For the price averaging €7-10, I think I can drink it happily with a nice hearty meal, especially some exotic and spicy food, which is difficult to pair with tannic and earthy Bordeaux reds. I would rather have cheerful cru Beaujolais than cheap flabby Bordeaux. I was glad that this experience got rid of my prejudice about Beaujolais and I will definitely search for some when they are around. We continued on and soon started driving along Le Rhone near Lyon. 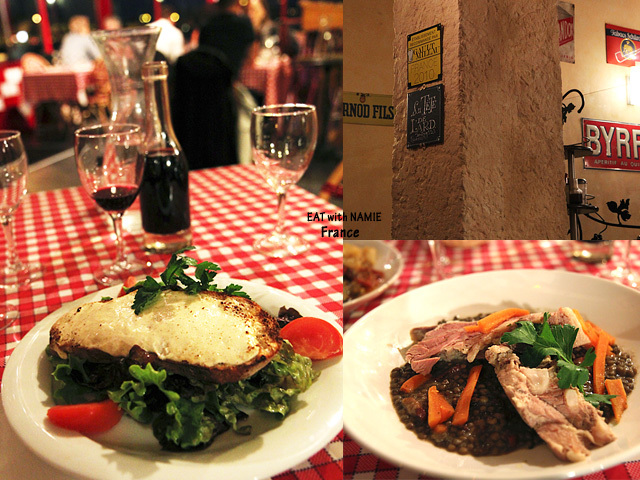 There we had another gastronomic dinner at a lively restaurant, La Tete de Lard, and I ordered things I didn’t try the last time I was in Lyon, Petit salé aux lentilles, and the second try of Andouillette, which was the best I’d had and I preferred it to the salt-cured pork. 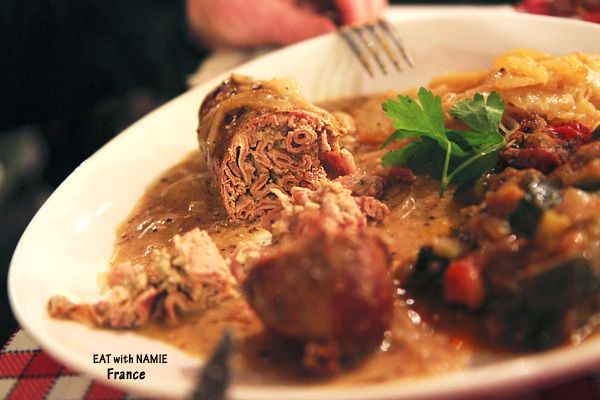 Pork, veau, pork, veau…it’s a meaty region. 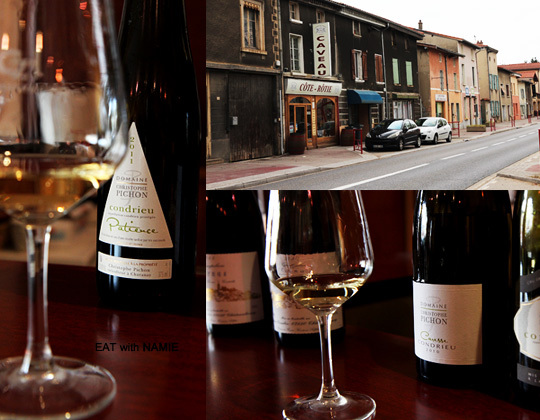 The next day we were in the northern Rhone, my favourite! 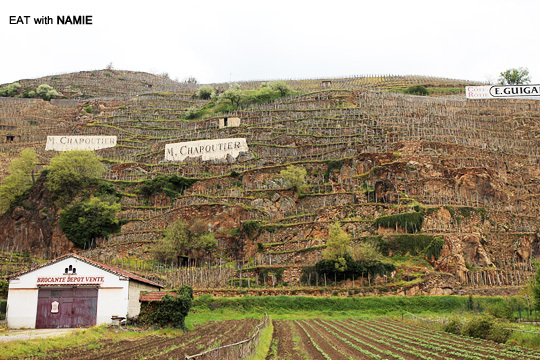 Reaching Ampuis, across to the right bank of the Rhone river, I came into this unusual sight of terraced vineyards on steep slopes. Who the heck planted grapes there in the first place? How the heck do they walk up and down the hills to work and pick the grapes? 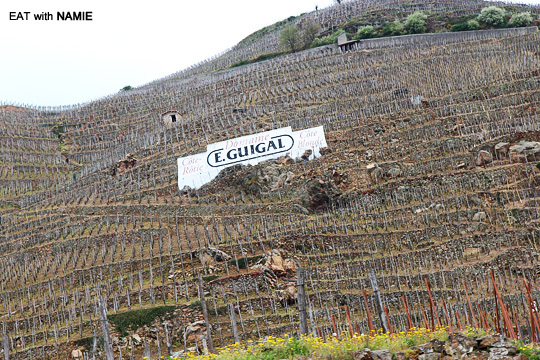 Billboards of three celebrated producers, Marcel Guigal, M.Chapoutier, and Paul Jaboulet Aîné ….just incredible! They reminded me of the Hollywood sign. Apparently, these are the oldest vineyards in France, first planted by the Romans, and the praise of the wines from this place by Pliny the Elder was documented 2000 years ago. The billboard of Paul Jaboulet Aîné, whose wines I tasted later, is seen on the hill over the bank of Tain L’Hermitage. Personally I am quite cautious of wines from this region because I’ve had so many bad experiences with Côte Rôtie. Some of the wines had an unpleasant level of reduction, with a whizz of cat’s pee and meaty aromas on the nose. Perhaps, they were not high quality or I was overly sensitive to those aromas. Wines from this region are quite expensive for average quality because as you can see, there are only a few big producers making wines and as they are small production and highly sought-after, the prices go pretty steep. But after seeing these vineyards, I can understand how demanding the managing the vineyards would be and I hope the growers get their fair share. Anyway, we stopped in a Côte Rôtie Cave and tasted some white peppery Syrah wines and peachy, floral, full-bodied Condrieu, made from Viognier. The sweet late harvest Viognier, Patience, had really special honey, nectar, floral tastes, and the oaked Caresse was also good, but the reds were so so. 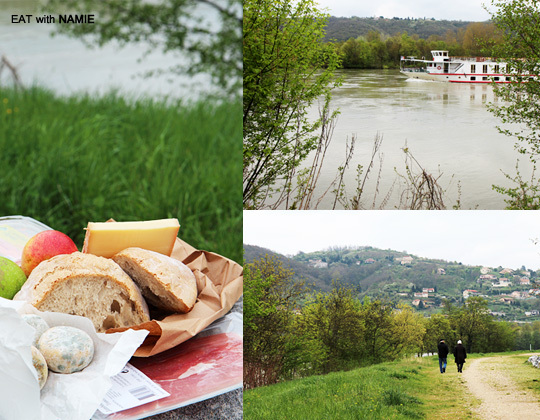 Before heading down to the darker red sites, Crozes-Hermitage and Côtes du Rhone including Gigondas and perhaps all the way to Chateauneuf-du-Pape, we had a lovely picnic by the river Rhone with the assortment of foods we had picked up along the way. 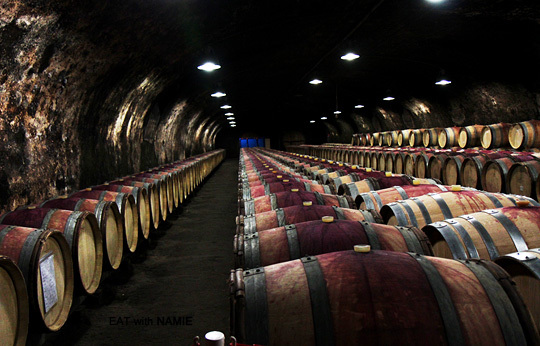 In two boutique caves, we covered some of the northern Rhone wines. I liked the Gigondas by Paul Jaboulet Aine, which tasted almost like my pepper mill mixture; black, white, pink peppercorns and mustard seeds with rosemary and anise. The rich dark fruit-driven wine with lots of spices made the full-on road trip worthwhile after all. The tasting at the M.Chapoutier cave was pretty interesting. The guy, who was preparing to close the store, was very patient with last minute comers, explaining everything with professionalism. The wines were all delicious without any flaws to point out. 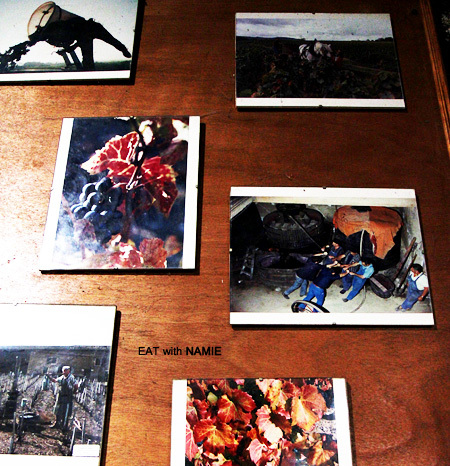 While tasting wines by this international giant wine enterprise, I understood how they could make such a success. Apparently they made changes to the wine making techniques, bringing back the traditional pigeage (stomping the grapes by foot) and advocating lunar viticulture. 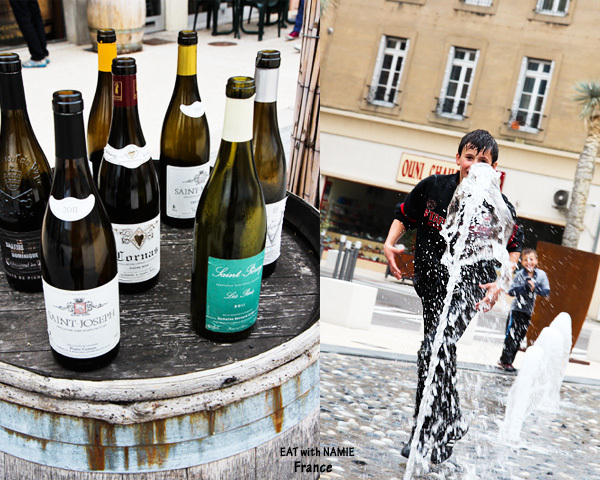 I don’t know and I don’t want to be biased here, but having said that, over the last two months of studying French wines, I’d discovered that some of the most impressive wines were supposedly biodynamic wines. It might have been purely accidental but I am a strong believer in that if the vines and grapes are cared for, the wines are bound to taste good. 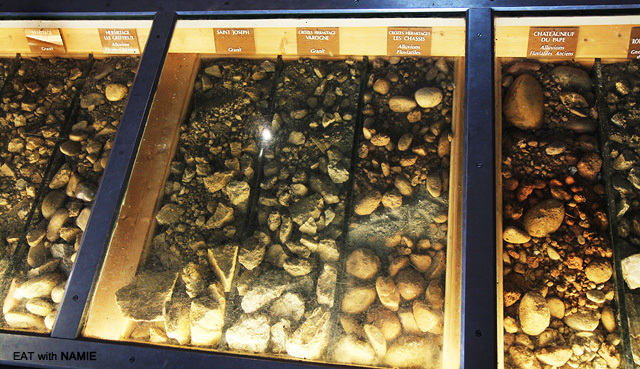 It was very nice of them to have the display of different soils for wine dummies like me as they made special labels for the blind. 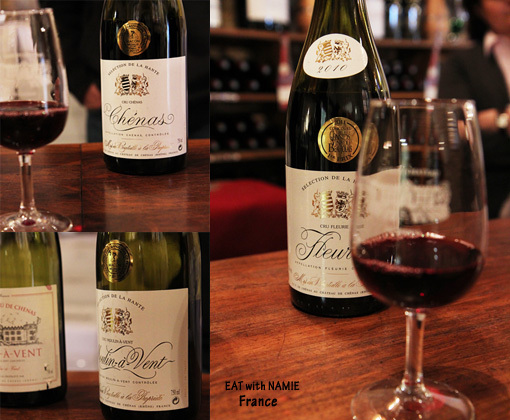 As you can see, Chateauneuf du Pape has different compositions of red, sandy clay and pebbles known as galets roules. Well, where am I heading next? Continue further down to the southern Rhone or return to Bordeaux? I will see in the morning where my wine desire will lead me…. A bientot! Close to the house, Macon, Beaujolais and many interesting tours like this can be found in the area.